In 2009 President Obama inherited the worst economic conditions this country had seen since at least 1981, if not 1929. Investors had lost faith in financial markets. Uncertainty in goods and services markets locked up the labor market. And newly indebted home owners lost the means to consume. There was no bottom in sight. 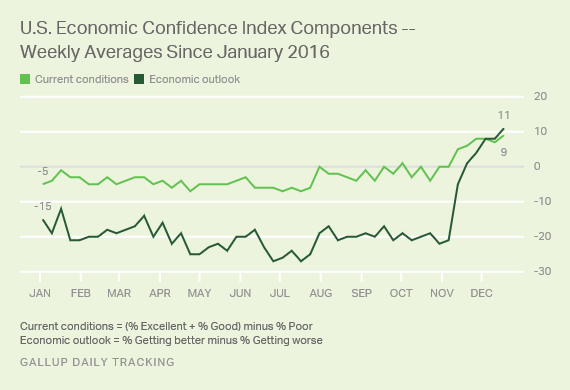 Gallup recorded an economic confidence (ECI) score of -65 when Obama took office. And that number never got back to black until this month when it magically shot up 31 points after Trump's election. Obviously we can speculate that Republicans are only now accepting Obama's economy as good because a Republican is about to take office. But then shouldn't we expect Democrats to shift the opposite way? In that "both siderist" scenario, the ECI should look fairly flat. As any liberal blogger can tell you, both siderists don't deal in reality. So what is the reality here? It's quite simple actually. Liberals view economic conditions the way they are supposed to look at them. If the economy is doing well they have a favorable view (even when a Republican is sitting on the Iron Throne). If the economy is doing poorly, they have an unfavorable view (even when a Democrat is in charge). But it's pretty clear that Conservatives don't operate the same way. With the economy collapsing in 2008, Conservatives were saying things like "the fundamentals of the economy are strong." They pointed to Bush's housing-led growth from 2003 to 2007 as "52 months of ... uninterrupted job creation, longest in the history of the country." Which brings me to my main question, who is to blame for this divide? As it turns out, in the 1990s, Republicans actually thought the Clinton economy was great... at least until 1998. In 1998 even as we were experiencing the best economic growth in the post-war period, a new channel was starting to become available on TV sets nationwide. In 1996, 17 million households had access to Fox News. Over the next four years that number was up 440%. And with that greater reach came the first steps toward the idiocracy.